Stapeliads are stem succulents, which means they have fat stems that retain water to enable survival in hot, dry parts of Africa, the Middle East and Asia. 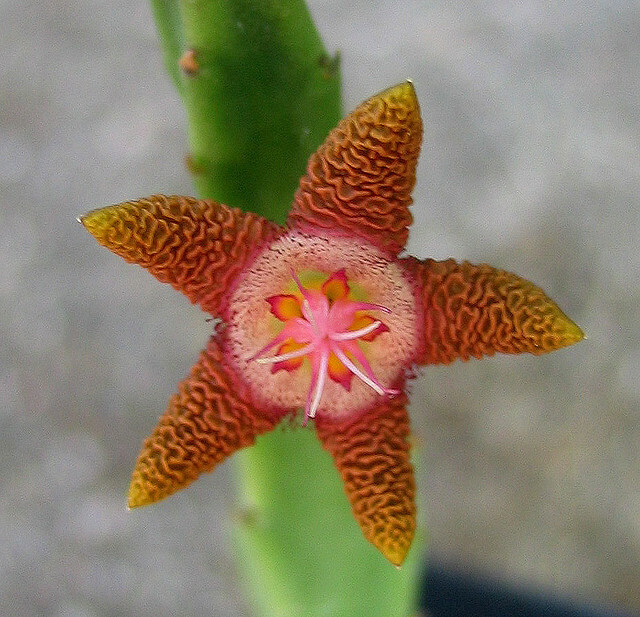 Many take it to such an extent that they resemble cacti with the same thorny little leaves. Others have leaves that look much more like... leaves. But we'll be focusing on those glorious flowers! There's a serious deficit of delicate forms and pastel colours here. Instead, we are confronted with hairy, meaty, blooms, emblazoned with blotchy patterns and clashing colours. Other Stapeliads use a more typically flowery perfume and are pollinated by moths and butterflies. Indeed, you can mount a good defence for the beauty of many of these flowers, but you really must agree that Stapeliads come from a totally different tradition to old fashioned daisies and roses. Wrinkly, warty, blotchy and yucky! 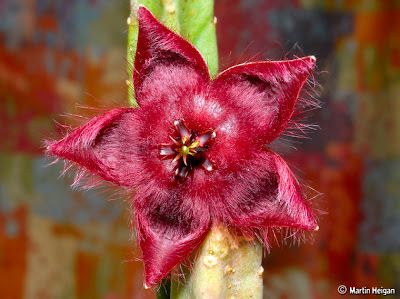 Some Stapeliad flowers look like rotting flesh, others look like rotting flowers. Some of them branch out into looking nice and healthy, but usually stuff like leprosy springs to mind. 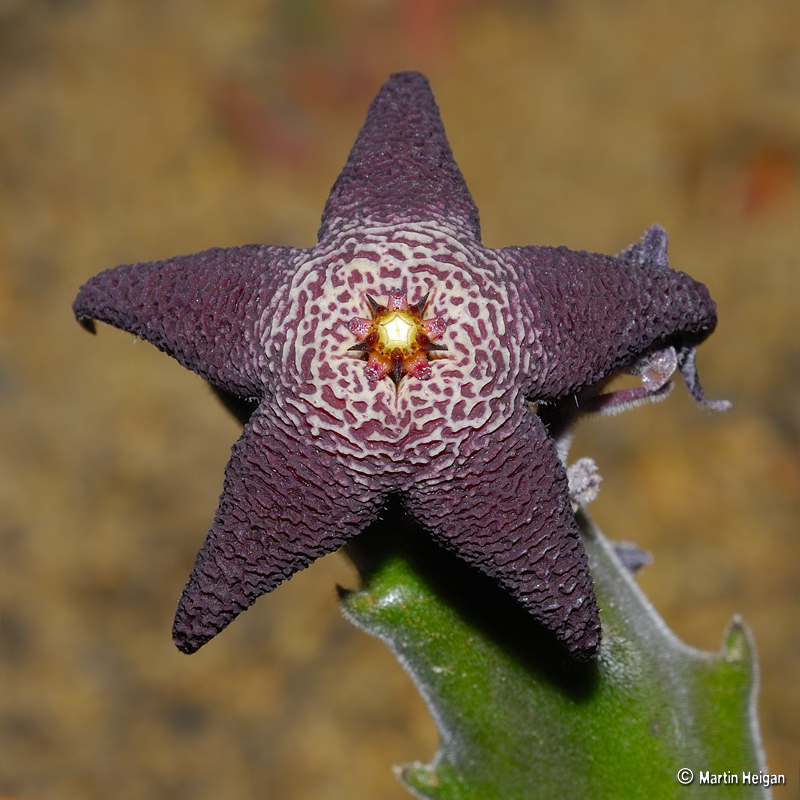 Some Stapeliads look like they're completely dead, maybe even burnt to a crisp. This one looks a lot like light at the end of a tunnel. All that surrounding ugliness makes that central point of brightness amazingly spectacular and welcoming. 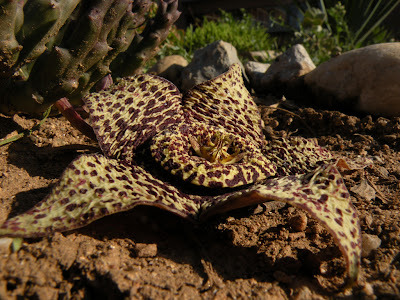 This is an utterly extraordinary flower that appears about ready to creep and crawl away. A closer look reveals a spectacular and elaborate crown that could befit the head of only the highest of high fantasy Elven queens. S. flavopurpurea is actually rather variable. Here's a specimen more deserving of its name, which is the Latin flavus meaning yellow and purpurea meaning purple. It gives them a lovely warm glow. 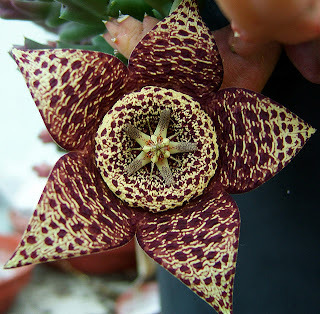 The biggest Stapeliad flower of the lot is the appropriately named S. gigantea. It can reach over 30 cm (1 foot) in diameter. Here it looks marvellously bright and cheerful, even though the middle of it makes me think of a bullet wound. A lot of Stapeliad flowers are much smaller, sometimes just a few millimetres across. I don't think I've ever thought that a flower looked 'cute' before. Isn't this just the weirdest thing ever? Some kind of Yeti flower! I imagine people at flower shows carefully brushing the petals of their prize blooms with a small comb. You could make clothes out of this thing! 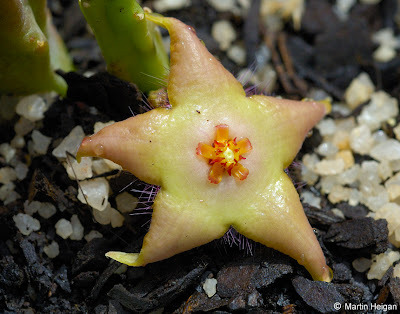 Even Stapeliads like a bit of yellow. Here we see one with a lovely, zestful colour. 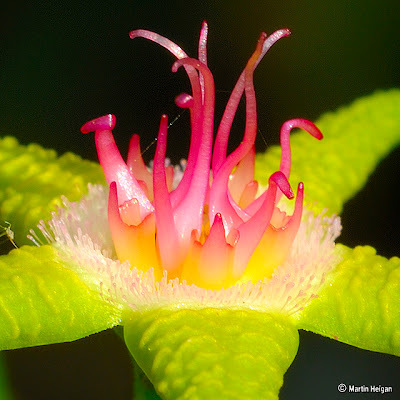 It retains that peculiar 5-fold symmetry and a smooth surface that just looks really odd on a flower. It's been rained on a bit, but it actually looks like a caricature of a star breaking into a sweat as it runs off somewhere. Is this from Earth? 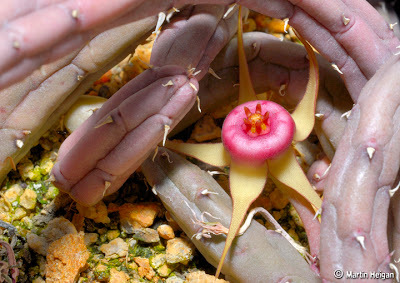 Those chunky stems look like evil worms or evil tentacles on some evil beast. I imagine malevolent writhing and a sinister voice emanating from somewhere within its midst. The weird thing about the flower is that half of it would look fairly normal if they were leaves. Instead there's this strange ring of colour in the middle and the rest of the petals just can't be bothered. I love this! 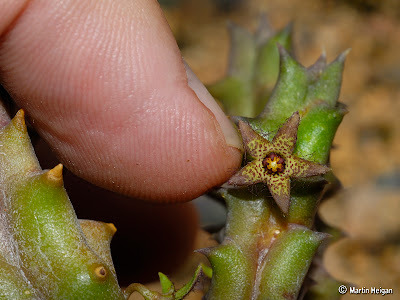 Stapeliads are not just weird, they appear to actively ENJOY being weird! 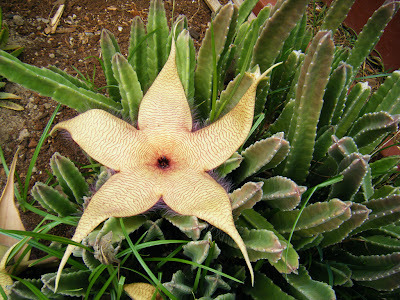 Does Lady Gaga have a Stapeliad costume yet? i wonder if vultures would be faked out by these blooms? I find it hard to believe that a vulture would fall for it. I should think that they have better eyesight and a better view so that whatever makes us see through the ruse would also work for them. I have no idea, though! The real problem is that they probably wouldn't appreciate the little running star like we do! They all look rather like starfish to me. They do! The petals look so thick and crinkly. Alongside the simplicity and the 5-fold symmetry, there's just an amazing resemblance. The moment you say "meat flower," I'm instantly thinking of Georgia O'Keefe for some reason. Stapelia flavopurpurea looks like a horrible tentacled nightmare from beyond the stars emerging from a dimensional portal. Makes me wonder if Lovecraft had one on his desk. 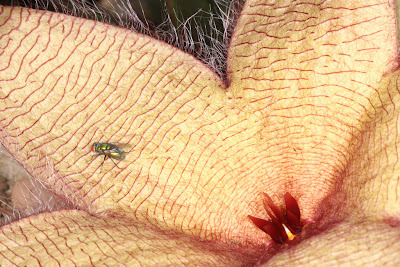 Stapelia giantea just looks a little too much like flesh. Someone should let it know it's borderline inappropriate. I'm afraid I actually had to look up Georgia O'Keefe! I guess I need to get myself some more culture. 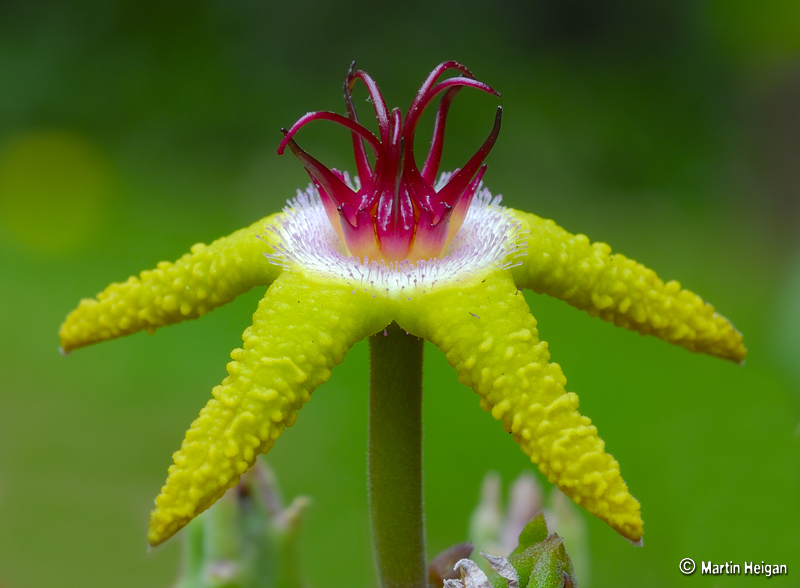 I can scarcely believe I'm saying this about a flower but "looks like a horrible tentacled nightmare from beyond the stars emerging from a dimensional portal"... so true! And yeh, gigantea pretty much needs some underpants. At least you didn't have to look up Lovecraft, and now you know the name of an artist famous for painting flower vaginas. Which is really great because flower vaginas have always featured prominently on my list of favourite things. 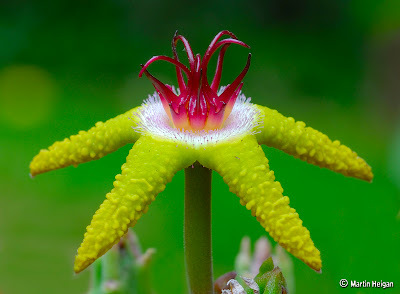 :D I can scarcely believe a flower can look like that!